3/3/2014Share this story on Facebook! Matt Payne ’01 has always been into monsters. After working in multimedia production for nearly a decade, he decided to channel his passion into a book series. 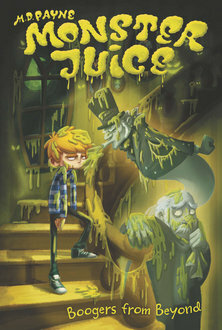 The series, Monster Juice, debuted last August. The Monster Juice books weave together multiple genres to form unique plot lines. They’re a blend of horror and comedy, like R.L. Stine’s Goosebumps series; and gross-out books, like Dav Pilkey’s Captain Underpants. “I feel very happy with the way I've weaved the three together,” Payne said. The idea for the series came from a brainstorming session after Payne was working on a project for a book publisher. Payne’s inspiration for the stories themselves come from mixing his own life experiences with these crazy ideas. He’s been writing since middle school, when he won a Young Writer’s Competition for a horror story he wrote. He also draws from a lifetime love of all things spooky, from the Count on Sesame Street, to the comedy Young Frankenstein, to horror movie Alien. Even today, Payne comes up with stories based on the crazy explanations he invents for things he encounters. For instance, he created the concept for his second book after seeing something that looked like worm skin in the water while snorkeling in St. Martin. “My mind just immediately made up a crazy story in answer to the question, 'Where did the skin come from?’” Payne said. His main goal when writing the series was to get kids excited about reading. Payne gets to see their excitement firsthand when traveling around and reading in schools. Payne’s latest book, Boogers from the Beyond, was released in February. It’s available in Barnes & Noble, over 300 independent bookstores, and grocery stores such as Wegmans and Kroger. Payne plans to keep adding more books to the series. He’s also interested in exploring the possibility of writing young adult sci-fi or historical fiction — with “lots of risk-taking and rule-breaking,” of course.